Trees or shrubs , to 35 m; trunks usually several, branching excurrent to deliquescent. Bark of trunks and branches light gray to dark brown, thin, smooth, close; lenticels often present, pale, prominent, sometimes horizontally expanded. Wood nearly white, turning reddish upon exposure to air, moderately light and soft, texture fine. Branches, branchlets, and twigs nearly 2-ranked to diffuse; young twigs uniform or ( Alnus subg. Alnobetula ) differentiated into long and short shoots. Winter buds stipitate (nearly sessile in Alnus subg. Alnobetula ), narrowly to broadly ovoid or ellipsoid, terete, apex acute to rounded; scales 2--3, valvate, or ( Alnus subg. Alnobetula ) several, imbricate, smooth, or ( Alnus subg. Clethropsis ) sometimes none. Leaves borne on long or short shoots, 3-ranked to nearly 2-ranked. Leaf blade ovate to elliptic or obovate, thin to leathery, base variable, cuneate to rounded, margins doubly serrate, serrate, serrulate, or nearly entire, apex variable, acute to obtuse or acuminate to rounded; surfaces glabrous to tomentose, abaxially sometimes resinous-glandular. Inflorescences: staminate catkins lateral, in racemose clusters or ( Alnus subg. Clethropsis ) solitary, formed ( Alnus subg. Alnus and Clethropsis ) during previous growing season and exposed or enclosed in buds during winter, or ( Alnus subg. Clethropsis ) formed and expanding during same growing season, expanding before or with leaves; pistillate catkins proximal to staminate catkins, solitary or in relatively small racemose clusters, erect to nearly pendulous, ovoid to ellipsoid, firm; scales and flowers crowded, developing and maturing at same time as staminate catkins. Staminate flowers in catkins, 3 per scale; stamens (3--)4(--6); anthers and filaments undivided. Pistillate flowers usually 2 per scale. Infructescences erect or pendulous; scales persistent long after release of fruits, with 5 lobes, greatly thickened, woody. Fruits tiny samaras, lateral wings 2, leathery or membranaceous, reduced or essentially absent in some species. x = 7. Alders resemble birches but are easily distinguished from them by the infructescences, which consist of persistent, 5-lobed, woody scales (versus deciduous, 3-lobed, thin scales). Except in members of Alnus subg. Alnobetula Petermann (which have nearly sessile buds with several imbricate scales), alders are also distinctive in their stipitate buds bearing two stipular scales. The fruits, borne two to a scale, are laterally winged, although the wings are sometimes reduced or absent. 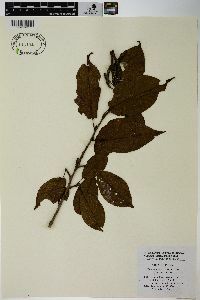 The genus is diverse, including several very distinct lines of specialization. The shrubby or arborescent Alnus subg. Alnus is characterized by winter buds with long stalks and two valvate scales, inflorescences borne in racemose clusters, and development of both pistillate and staminate inflorescences during the growing season prior to anthesis, with these fully exposed during winter. It includes the common A . rubra , A . incana , A . oblongifolia , and A . serrulata . 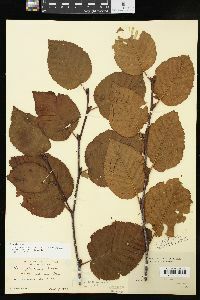 Alnus subg. 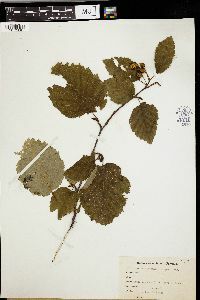 Alnobetula (represented in North America by three subspecies of A . viridis ) consists of shrubby species of cold-climate regions. In this group, the buds are nearly sessile and covered by several imbricate scales. Both staminate and pistillate catkins are formed the season before anthesis, but only the staminate ones are exposed during winter. The predominantly Asian Alnus subg. Clethropsis (Spach) Regel is represented in America by a single species, A . maritima , a small tree or large shrub of stream banks, marshes, and the shores of shallow lakes. Members of this group are unique in that they bloom in autumn rather than spring. 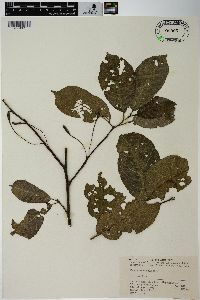 They also differ from other native species in Alnus in having essentially naked buds, leaves with semicraspedodromous venation (i.e., with the secondary veins branching and anastomosing with each other near the margin before reaching the teeth), and solitary pistillate inflorescences borne in the axils of foliage leaves. 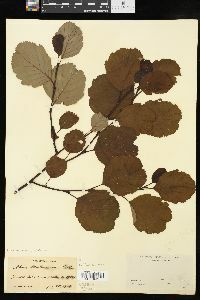 All of the alders associate symbiotically with species of the actinomycete Frankia , leading to the formation of nodules on the roots of the plants and the fixation of atmospheric nitrogen. Staminate catkins pendulous, usually clustered, each bract subtending 3 fls with minute, 4-parted cal and 4 stamens with short, undivided filaments; pistillate catkins becoming woody, long-persistent, short, ovoid to ellipsoid or short-cylindric, each bract subtending 2 fls without cal; bracts of the pistillate catkins adnate to the bractlets, the compound unit cuneate, rounded or truncate and lobed at the summit; fr a small achene or samara, crowned with the 2 short, persistent styles and surrounded by a thin margin or membranous wing; trees or shrubs with 3-angled pith and broad, ovate to obovate, deciduous lvs. 30, mostly N. Hemisphere.